Do you love receiving handmade cards? How about making them? I love both, but I am not a big fan of sitting down and breaking out all my supplies just to make one card. However, I am a huge fan of doodling! 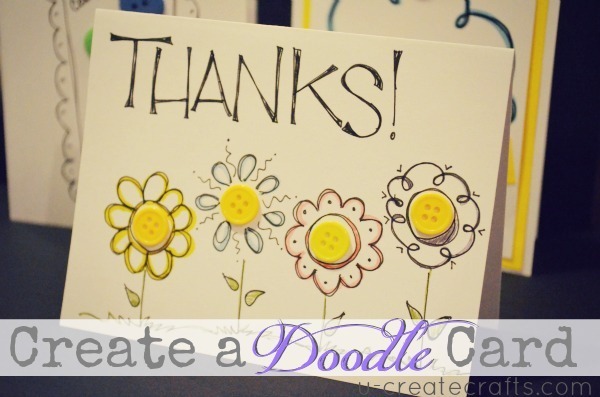 So when I needed a quick “Thank You” card I grabbed some buttons and my pens and created one pretty quickly. Then I made another one and another one. Then I made a tutorial just for you! Wow!you make it look so easy. Really cute card. another great idea. I love to doodle but not very good at it. this would be a fun thing for teenage girls to do. Thank you! So much! I just made one for my 1st Graders teacher! It says WELCOME BACK instead! So so cute!! !